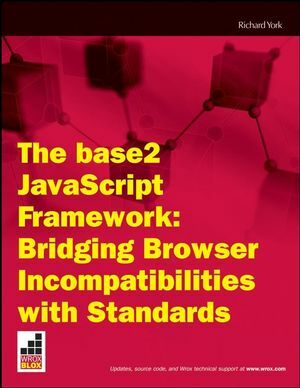 You will also learn about base2’s pioneering support for the W3C Selectors API that was recently natively implemented in Internet Explorer 8.0, Firefox 3.1, Safari 3.0, and Opera 10. base2 utilizes the native implementation when one is present for speed and efficiency and falls back on its own implementation when one is not present. In addition, you will learn about a couple of methods from base2’s rich API set. base2 provides the indexOf() and lastIndexOf() methods for arrays, and provides several other useful enhancements to strings and arrays, such as the forEach() method, which makes enumeration less verbose. Finally, base2 is even looking forward to the emerging HTML5 draft specification with support for the classList property and its methods, add(), remove(), toggle(), and has(), which let you easily manipulate the class names of elements in the DOM. Also includes some discussion of base2's support for de facto standards, such as Mozilla's array extras, and the DOMContentLoaded event, which reduce the amount of code you need to write, in addition to making your scripts load more quickly.